Step 1: Dont deprive yourself: I love, love, love, having something on the side when I eat sandwiches. A great alternative to regular unhealthy chips are Special K cracker chips that taste amazing. At only 110 calories for 27 chips, it's a win, win. 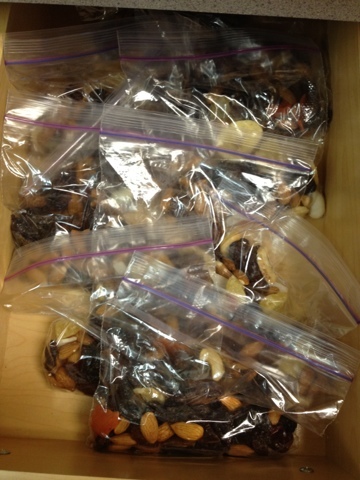 Step 2: Use portion control: I LOVE dried fruits/trail mix and I could sit and finish bags in one sitting. In order to exercise portion control, I've started to make snack baggies ready to grab and go. 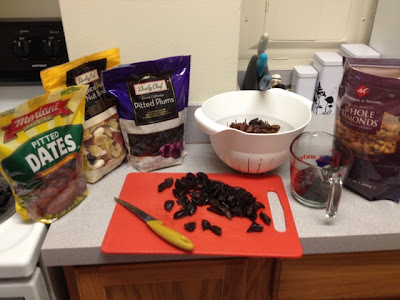 Store bought trail mixes never have the right combo of things that I like, so I made my own. I bought the things that I like: dates, plums, assorted dried fruit mix, almonds and cashews in bulk from Sam's club. I put two cups of each product in a big bowl and mix it. (The 2 cups of plums and dates were measured prior to cutting them up). Then I put one handful of the mix in a ziploc bag. This made 11 bags and is a great snack paired with a cup of yogurt drizzled with honey. Step 3: Eat every 3 hours: Breakfast, snack, lunch, snack, dinner. This method gives you 5 'meals' a day which is great for staying full and eating only when you need to. Once you get this pattern down, your body will know when to expect food. This helps maintain a good controlled eating schedule. Step 4: Shop smart: Buy healthy, eat healthy. Don't buy things you will regret eating. I always buy veggies and fruits knowing I will force myself to incorporate them in meals so they don't go to waste. 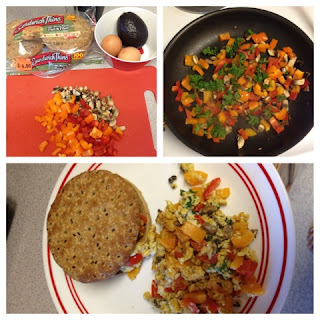 Yesterday, I had half a red and orange bell pepper, cilantro, avocado and mushrooms that were going to go bad soon. I incorporated them into my usual 2 eggs sandwich. 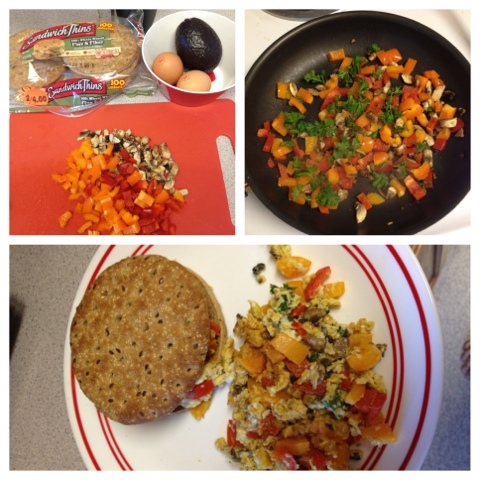 The more veggies you add, the more good food you're eating. 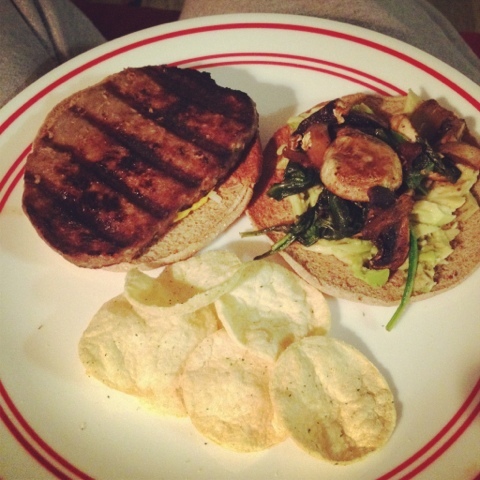 I did the same for dinner tonight, I saute'd mushrooms and spinach to put on my burger. I love my George Foreman grill, it's the only way I'll eat a burger! Step 5: Don't count calories: There is nothing I hate more than this! It's not about the amount of calories you take in, but rather what you do take in. It's okay to be calorie conscious, but don't count every little thing. The only time I consider calories is when I'm grocery shopping and its in my face. I buy the 100 calorie labeled wheat breads and chips because I think to myself, "why not?". These small things help but you don't need to be on the watch 24/7. I hope this helps you start thinking of ways to clean up your eating habits. Remember this is a lifestyle change, not just a temporary thing! What are some tips you have?